Indian Prime Minister Manmohan Singh has said he has "nothing to hide" from an investigation into the sale of phone licences for a fraction of their value. 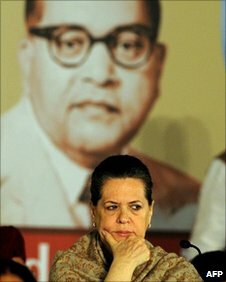 He told a party meeting he was ready to be questioned by a parliamentary panel in the so-called 2G spectrum inquiry. Ex-telecoms minister A Raja, who resigned over the scandal, is expected to be questioned soon by India's top investigation agency, the CBI. Parliament has been deadlocked over opposition demands for a major inquiry. Addressing the ruling Congress party's first plenary session since 2006, attended by about 15,000 members, Mr Singh rejected suggestions that he had turned a blind eye to the scandal. "I have nothing to hide from the public at all," Mr Singh said on Monday. He said he was writing to notify the chairman of a parliamentary committee that he would be happy to appear before it. A cross-party parliamentary public accounts committee is currently examining the federal auditor's report into the scandal. But the opposition has been demanding that the matter be investigated by a joint parliamentary committee, which has more scope. 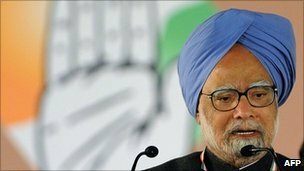 The BBC's Soutik Biswas in Delhi says it was an unusually combative defence by the Mr Singh, who has been seen as reticent and low-key since he became prime minister in 2004. "I sincerely believe, like Caesar's wife, the prime minister should be above suspicion, and it is for this reason that I am prepared to appear before the Public Accounts Committee," he said. Mr Singh also said he was ready to implement a five-point action plan to fight sleaze, unveiled on Sunday at the plenary meeting by Congress party president Sonia Gandhi. In her speech, she said graft was a "disease spreading through our society". Her proposal includes fast-tracking graft probes against civil servants and politicians, state-funding of elections, greater government transparency and cutting back on politicians' discretionary powers to allot land. Meanwhile, the former telecommunications minister, Mr Raja, who was forced to quit last month, but has always denied any wrongdoing, remained defiant on Monday. "I am not afraid of the CBI," he was quoted by the Times of India newspaper as having told journalists in Madras (Chennai). "I am a lawyer. As a lawyer, I will abide by the law. I will not evade the law." The Central Bureau of Investigation raided Mr Raja's premises this month and is expected to question him about claims he issued 2G licences on a first-come, first-served basis instead of auctioning them. The national auditor said the 2008 sale cost the government up to $37bn (£23bn) in lost revenue. India has seen a slew of high-profile corruption investigations in recent months. Organisers of the Delhi Commonwealth Games have been arrested on charges of swindling millions of dollars before the October event. The Congress party last month ordered the chief minister of the western state of Maharashtra to quit over his alleged role in a scam involving homes meant for war widows being given to relatives and bureaucrats.